If you have ever wanted to make a quilt (like me) but even the beginner quilt tutorials seem intimidating to you (like me) I think I have finally found a quilt tutorial that I am comfortable tackling. This gorgeous quilt can be created start to finish in one day, even without staying up until the wee hours of the morning. It is a great time to make one as a homemade Christmas present (or baby shower present) too! 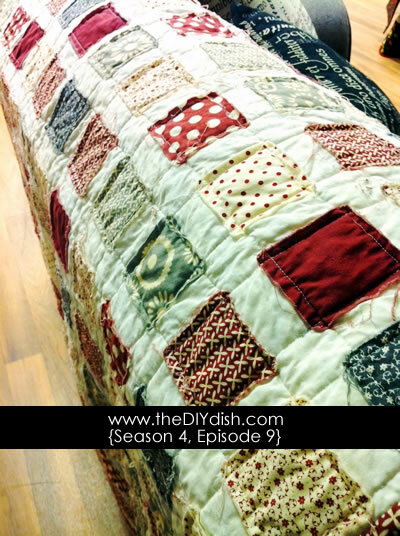 You can check out this easy quilt tutorial over on The DIY Dish. Quilts scare me! I'd love to make one, but can't get over the idea that it is daunting work. This looks fun! The link is off though. Thanks for the heads up Gwen. I fixed the link. And the video is about 11 minutes long, but I honestly feel like I could easily make this quilt after watching it! OMG I know what I'll be doing next year. I love these.